This page briefly goes over the active finger marker set and how it needs to be set up. 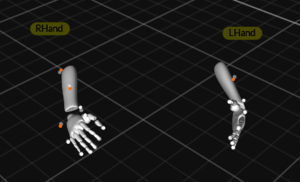 Active finger markerset tracking both hands. The active finger markerset utilize the tracking capability of active markers and it active labeling features to accomplish tracking of both the hands and the fingers. These markersets require the active marker tracking solution and the Tag(s). Wired from an active Tag, each active marker must attach to the expected locations. For each hand, 8 active markers and three passive markers, a total of 11 markers, are needed. Active Tag(s) with active markers. Something like a glove to attach the markers. Total 11 markers will be attached on each hand. Tag: First of all, attach an active Tag to each hand for synchronizing and powering the active LEDs. Active Markers (8): Each Tag connects up to 8 active markers. Position the wired active markers at the tip of all five fingers (5), one each on the knuckle of the index finger and the pinky finger (2), and lastly, place the remaining active marker on the inside (medial side) of the wrist axis. Passive Markers (3): Attach one passive marker to the outside (lateral side) of the wrist axis. 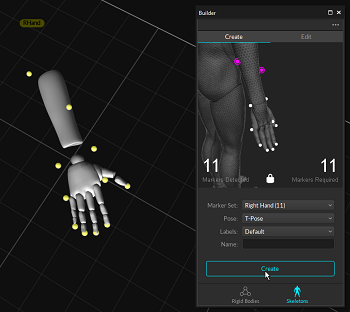 Then, place the remaining two passive markers on the lateral and medial side of the forearm segment as shown in the Builder pane. 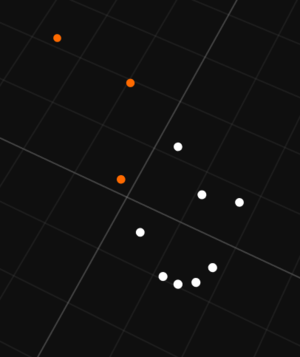 Marker placements shown in the Builder pane. 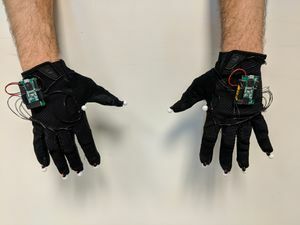 Example prototype of the active marker gloves. Total 8 active markers are attached on the finger tips (5), the knuckle (2), and the wrist (1) of each hand along with the three additional passive markers. Open the Builder pane and select the desired hand markerset under the drop-down menu. Make sure all of the markers are placed in the correct positions. 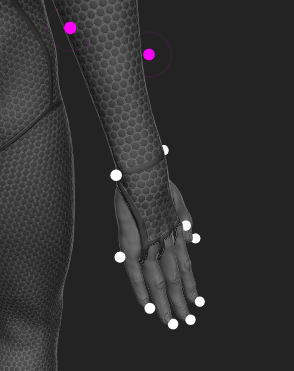 For markersets that has additional markers (Baseline + Toe + Active Fingers (53), 4 Rigid Body + Active Fingers (18)), make sure the other markers are placed at the proper locations as well. Once the markers have been placed, ask the subject to strike the calibration pose. 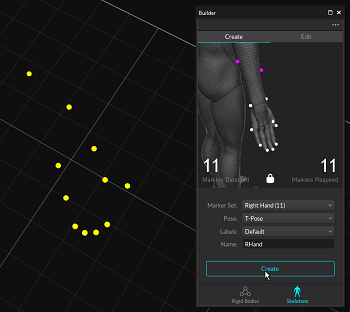 Select the finger markers in the 3D viewport. The Marker Detected must match Marker Required in the Builder pane. This page was last modified on 10 October 2018, at 10:56.